Behance is the leading portfolio platform where designers can both showcase and discover creative work. Let’s take a look at the amazing things that happened in this community for the past year. 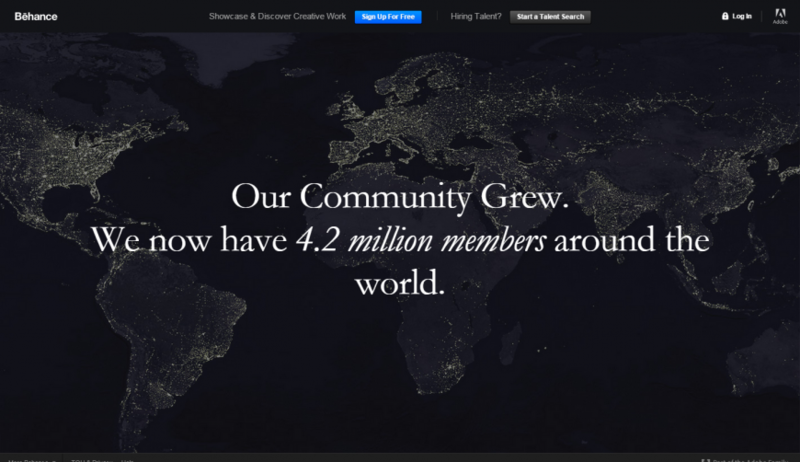 Behance is continuously growing and currently has an average of 4.2 million members around the globe. Instagram Experiments, a project by Ecuador-based graphic designer and audiovisual producer Javier Perez, attracted the attention of the creative world that eventually led to a National Geographic cover and a publication deal with Penguin Random House. The project features conceptual photos of everyday objects combined with whimsical drawings. The work of 18-YEAR OLD digital artist Ahmed Emad Eldin caught the eye of the creative team behind English rock band, Pink Floyd, and chose one of his artworks for the band’s The Endless River album cover. An Italian comic artist and illustrator named Denis Medri was hired by MARVEL to develop the “Steampunk Lady Spider” character design for the Spiderman Comic Series after it caught the attention of comic book geeks. Brooklyn-based photographer Navid Baraty‘s amazing aerial shots of New York City in his project “Intersection | NYC” landed him talks at Apple and the New York Public Library. The astonishing photographs were also featured in a dedicated exhibition by the MTA in an NYC subway station. The nCycle that started as an e-bike concept project by Marin Myftiu (Product & Transportation Designer) & Hussain Almossawi (Graphic & Product Designer) became a real working prototype. They were then invited to showcase it at one of the largest bike exhibitions in the world, the EuroBike 2014 show in Germany. In 2014, 585 events were organized in 93 countries where Behance members collaborated as part of Portfolio Review Week. It was also a year for a lot of love in the form of both appreciations and comments, and here are some of the most favored projects. Mumbai-based Shrenik Ganatra‘s Futura-inspired typeface “ADAM.CG PRO“, and typographer UPPERTYPE‘s gorgeous “Porto” font. Illustrator LORENA .G‘s “The Grand Budapest Hotel · Flat” project, a little tribute to the Wes Anderson flick using flat design, and the pixel art gifs of art director Dusan Cezek in his “Pixelwood” project featuring some of his favorite movie scenes. The functional and visual redesign of Google News by freelance interaction designer George Kvasnikov, and the Apple Store redesign concept of a London-based team Amber Creative. Freelance photographer Barbaros Kayan‘s “Occupy Kiev / War“, and São Paulo-based photographer Jorge Luiz Campos‘s “Peace Dog” – about the Favela military occupation in preparation for the 2014 FIFA World Cup in Brazil. The series of typographic prints in “The Hope Factory” project by Cape Town-based creative studio MUTI, and UN WOMEN’s “The Autocomplete Truth” ad campaign project. The “20th Anniversary OUT 100” project featuring portraits of the most influential individuals of the LGBT community and Canadian commercial photographer Joey L.‘s cinematic “Celebrity Portraits“. Photographer Alexander Semenov & branding/creative director Tobias van Schneider’s “Aquatilis Expedition“, and photographer Benoit Paillé‘s “CROSSROAD OF REALITIES“.